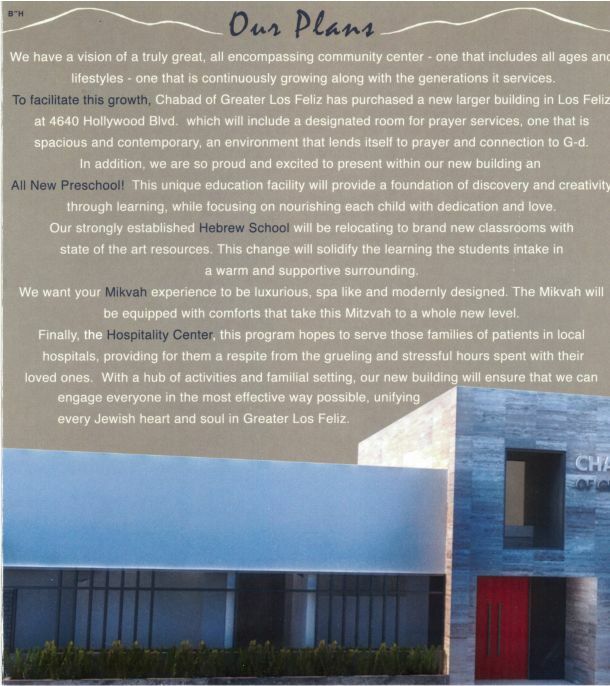 I received a notice from Chabad of Los Feliz that they are building and will be opening up a brand new center. http://www.chabadlosfeliz.org/. We say a blessing to God for letting us share is this great Simcha. Chabad of Greater Los Feliz is dedicated to providing every Jew regardless of background, philosophy or level of commitment, an open door environment for strengthening and enhancing Jewish family life. Chabad serves individuals and families looking for an anchor and non-judgmental, accepting, personalized Jewish experience. This is a great moment for Rabbi Korf and his wife, for Chabad of Los Feliz, for Chabad, and for Klal Yisroel. It is Thanksgiving 2001 and my father is in the Kaiser Permanete hospital at Sunset and Vermont. I flew into LA to be with my father. I was driving east on Sunset from La Brea to get to Kaiser Permanete. I thought there were no Jews from La Brea going east to Denver, Colorado. I was worried about Shabbos. I spent Thursday night with my father. It was terrible. The hospital did not give my father food as they had to test him to make sure he could swallow. It was excruciating watching my father in pain. Though the night he keep mumbling and saying occasional words. I imagined that he was re-living the holocaust. Finally in mid morning they had a therapist test my father and they were able to feed my father. On Friday morning I was speaking to Heshy Maryles and his wife telling them my problem about Shabbos. They told me that there is a Chabad house near the hospital. I was shocked and knew my prayers were answered. At 11:00 AM I called Rabbi Korf who told me that there is no problem. I can sleep in his house and have my Shabbos meals with them. I was with my father Friday afternoon and went over to the Korfs for Shabbos. Davened in their storefront Shul at 1727 N. Vermont. The Friday meal was inspiring. The house and table were set up beautifully and there was a full table of guests. Rabbi Korf was only 28 and his wife a drop younger and they had the poise of real adults. The only specific dialogue I remember is one 45-50 year woman who said that she was born in America and lacks the drive of immigrants who are driven to be successful. Being at the Friday night meal, I saw the embryo of a community and wanted to be part of it. It was beautiful. Rabbi Korf told me of his dream to build a Torah center and now 16 years after the Korfs showed me kindness, there dream is being fulfilled. Let us all be part of the Simcha and support the Korfs in their holy endeavor. Shabbos morning I went to visit my father and then made it to Shul at about 10:15M I was the 10th man. The Rabbi told me that the person who leined (about 50 years old) was a former Yeshiva bocher who went off the Derek. Rabbi Korf was bringing him back to religion, as only Lubavitch can do. At the Kiddush there was Cholent. I told the Rabbi, “Can you imagine, we are eating Cholent miles east of La Brea, well outside the Frum community, a very Jewish food where I thought there were no Jews. Seventeen years ago a young couple arrived in Los Angeles with a dream: to reach out to fellow Jews who might be unaffiliated, who might be disconnected from their heritage and their faith, who might want to learn about what it means to be Jewish through educational, cultural, social and spiritual activities in a warm, non-judgmental, supportive community. And so, Chabad of Greater Los Feliz was born, one of over three thousand similar Chabad Centers around the world. Rabbi Leibel Korf and his wife Dvonye started their first Chabad House in their own home, at 1944 N. Berendo Street in what was then the not-so-fashionable East Side of Los Angeles. With their six-month old baby Mendel at their side, they opened their doors and celebrated their first Shabbos in August 1998 with only two guests, neighborhood Jews who were pleasantly surprised by a dinner invitation from their community’s energetic new rabbi and rebbitzen. By that September, there were 25 people for High Holiday services. A few weeks later, over fifty people showed up for dinner in the Korfs’ backyard Sukkah. Soon, there was a Hebrew School in the living room, adult education classes at the dining room table, and a minyan for Shabbat. Slowly, the Korfs built strong relationships in a neighborhood that was turning into one of the hippest, liveliest and fastest-growing in Los Angeles. By July of 1999, when the Korfs moved into their present home at 1932 New Hampshire, the Chabad of Greater Los Feliz was still in the living room, but they now were providing educational and social programs to hundreds of local Jews. Speakers came to visit Los Feliz; there was a Lag B’Omer picnic in Griffith Park, and even the first sleepover Shabbaton at the Ramada Inn. By Rosh Hashana that year, there were so many worshippers the Rabbi had to rent a hall to accommodate them. In 2000, the Korfs opened their first true Chabad House, a storefront at 1727 N. Vermont Avenue. For five and a half years the little synagogue and community center in the mini-mall served neighborhood Jews with the Korfs’ trademark warmth and supportive spirit. Locals and visitors alike learned that they were always still welcome for Shabbos meals at the Korfs’ table, and if, G‑d forbid, they were hospitalized at any of the nearby hospitals, they and their families were never alone. The Korfs were always there to provide spiritual support, delicious kosher food, and religious services free of charge to anyone who needed them. 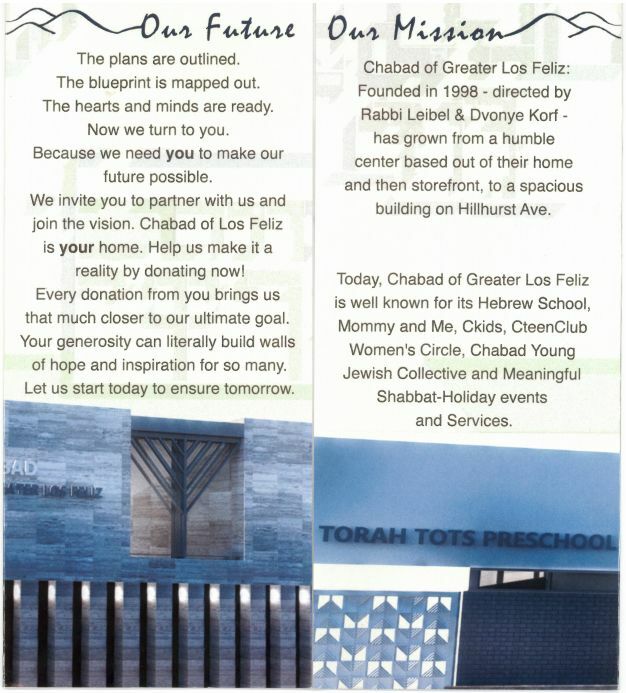 Chabad of Greater Los Feliz moved into its beautiful new building at 1930 Hillhurst Avenue in February of 2006. In the past years, through the generosity of the Rosenthal family and all of our other wonderful contributors, Oma’s Center (named for Martha Levisohn Auerbach, Phil Rosenthal’s grandmother) has attracted even more worshippers, students and eager members of our neighborhood’s thriving Jewish community. Rabbi Korf and Dvonye still feed us all, physically and spiritually, and now with six beautiful children they still open their home and their hearts to all of us. Recently, Rabbi Korf began a special program at Children’s Hospital, called the Rebbitzen Raichik Child First program, which offers a variety of services to children undergoing treatment and their families. We offer books, videos and storytelling, arts and crafts, and play activities for children of all ages, with three full-time volunteers at the hospital. We urge you to contact us whenever you have family or friends who need our help at a time we know can be so stressful and difficult. Chabad of Greater Los Feliz serves one of the most diverse Jewish communities in the United States, and certainly one of the most diverse Chabad Houses. The Korfs serve the young and the old, singles and families, working people and retirees, newlyweds and widows, Russians, Israelis, French. Latinos, blacks, whites, hipsters, converts, children – all of whom share a common faith and a common goal: to connect through Judaism to each other, to our heritage, to ourselves, and to G‑d. We wish you and our entire community continued blessings. May the past ten years be only the beginning of a long and fruitful relationship, as together we help Judaism to thrive in this special corner of the world, and hasten the coming of Moshiach with every mitzvah.